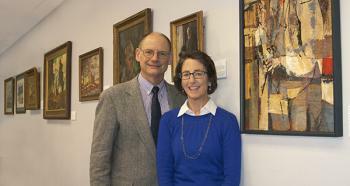 The formerly bare walls of the seminar room 368A Heady Hall are now home to 14 art pieces belonging to professor Peter Orazem and his wife, Patti Cotter. Orazem credits his mother for igniting his love of art when he was a boy. On their visits to museums, he fantasized about owning original paintings of his own one day. Later, traveling the world as a consultant for the World Bank, he began buying a piece of art from each country as a souvenir. He and his wife began populating the walls of their Ames home with that collection of paintings, drawings and lithographs, gradually adding paintings of the rolling hills of Iowa from local artists Keith VanDePol and Beth Weninger. He found just such a painting by Louis Lundean. Though he didn’t know the artist at the time, he later discovered that he’d been born in Council Bluffs, Iowa. Then, during a visit to the library, Orazem found the book, Iowa Artists of the First One Hundred Years, published in 1939 by Zenobia Brumbaugh Ness and Louise Orwig. The book inspired him to see how many works of these Iowa artists he could find. Many of the artists listed in the book were part of the WPA (Work Projects Administration) during the depression in the 1930s. The WPA was a New Deal agency that provided work for unemployed Americans, including artists. Orazem claims that his favorite art piece changes with the day. “I don’t have any one particular type of art that I prefer. I’m red-green colorblind so I’m not sure that I’m as keyed in on color as I am emotion. If you get an emotional response from a painting, I think that’s what you’re looking for. Orazem is proud of the fine art tradition at Iowa State, which has one of the largest campus public art programs in the United States. The small gallery in Heady is part of the more than 2,000 public works of art that make up the Art on Campus Collection located in buildings, open spaces and classrooms. Some of his favorites are the Grant Wood murals at the Parks Library from the 1930s. T.W. Schultz taught at Iowa State from 1930 to 1943, leaving in the wake of the “Oleomargarine” controversy. He later won the Nobel Prize in Economics in 1979. During that same period, George Stigler taught at Iowa State from 1936-1938 and went on to win the Nobel Prize in Economics in 1982. Ken Boulding, who taught from 1945 to 1949, later became president of numerous scholarly societies, and was nominated for the Nobel Prize in both Peace and Economics. Leonid Hurwicz, a pioneer in the field of game theory, taught at Iowa State from 1946 to 1951.